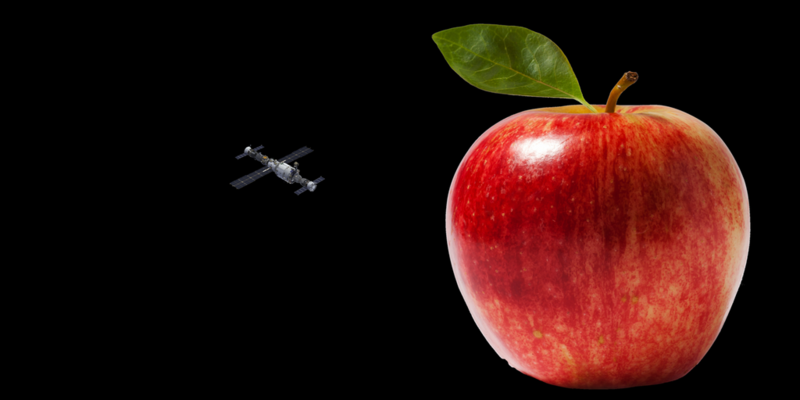 If the earth were about the size of an average apple, how far would the ISS be from it in orbit (to scale)? Nope. It would only be about this far… 2.7mm from the earth apple’s surface. By the way… With the earth at the scale of an apple, your eyeball would be about the size of our moon. Some people think astronauts get a view of half the earth from the ISS, however in reality, they can only see a relatively small portion of the entire earth’s surface (only about 3% at any given time). I’m sure it’s still an awesome view from there! The farther you get from the surface, the more of the surface you can see at 1 time. 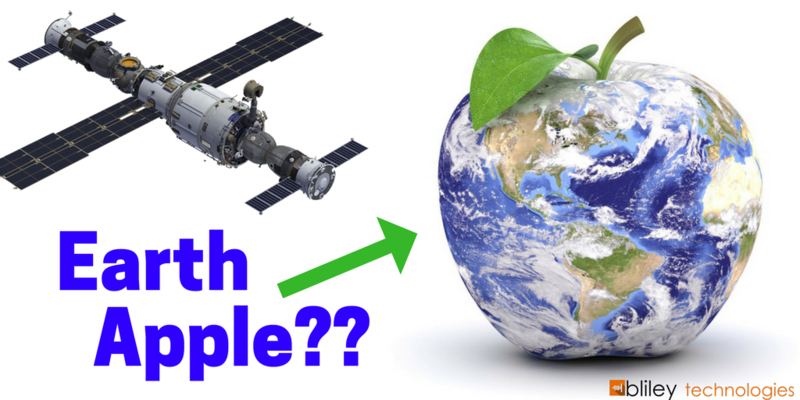 How far does a satellite need to be from the surface to provide reliable television, radio, and data coverage to the earth while also covering as much surface area as possible? Not to mention having to account for the right amount of gravitational pull to keep the satellite in orbit (not drifting toward or away from earth) and the speed of the satellite traveling around earth. A lot must be considered. Geostationary satellites (GEO) are placed into orbit about 22,236 miles (35,786 km) above the surface. That’s about 117,408,136 feet above you. At this distance, the satellite orbits around the world in 24 hours. That’s as fast as the earth rotates in one day. This allows the GEO satellite to hover over 1 particular location relative to earth. There are currently over 350 GEO satellites in orbit. These satellites would appear to be fully stationary in the sky from someone standing on earth. But in reality, the satellite is travelling almost 2 miles per second around the earth! (3 km/s). 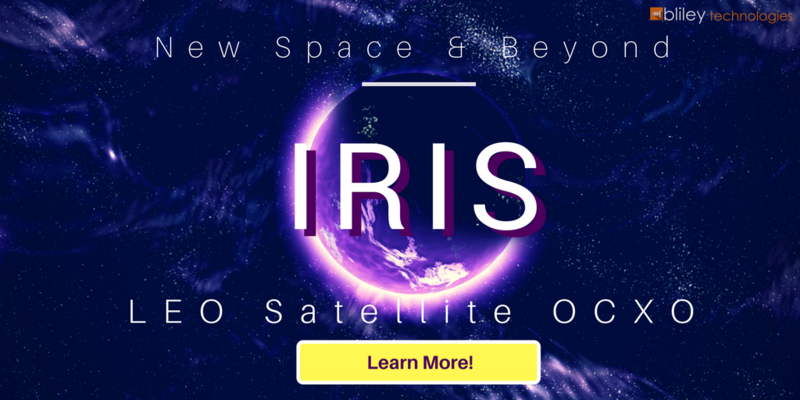 This makes GEO satellites perfect for telecommunications by connecting 2 or more points/towers thousands of miles apart on earth. This also provides quick data transfer to fixed antennas. Newer and smaller satellites referred to as Low Earth Orbit (LEO) satellites orbit closer to earth (as the name implies) but require more satellites to work together as one. These satellites are placed into orbit around 14,912 miles (24,000 km) above the ground. These satellites are strategically placed into orbit and travel in different directions around earth while communicating with each other and various points on earth. Satellite communication antennas are designed to cover precise zones anywhere from a single country to an entire continent. Believe it or not, certain frequency bands must be considered for satellites transmitting to locations with climate conditions that are frequently varying or extreme. 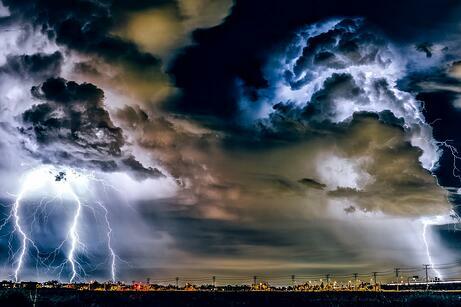 For example, lower frequencies tend to work great for areas with heavy rainfall. Here’s a quick list of common radio frequency bands with their corresponding typical uses. Once the satellite is delivered into the transfer orbit, it transfers data back to earth which allows controllers to analyze the performance of the satellite and makes sure everything is A-OK with the functionality of systems onboard. The satellite’s orbital window and antennas pointed toward earth are also consistently monitored. Controllers back on earth do bi-weekly check ups on the satellite to prevent any drift off course by using the on-board propulsion system. One or more inertia wheels within the satellite also help it maintain its stabilization using a gyroscopic effect. Additionally, with communications satellites, the power and frequencies must be consistently monitored to be sure they are not interfering with any other similar signals nearby. Connecting the Entire World. Everything…Everywhere. Using GEO sats, LEO sats, and small satellite terminals, it’s possible to have high speed internet access everywhere in the world. Advancements are already being made in this direction. Soon, everywhere including at sea and in-flight, to deserts and isolated communities, will have the pleaseure of experiencing wifi. This will eventually allow families without internet access to finally connect with the rest of the world. Not to mention countless amounts of other new innovations. Bliley is proud to be a part of the journey of connecting the entire world together with the newest innovations in Communications on the Move (COTM) and frequency control technology.